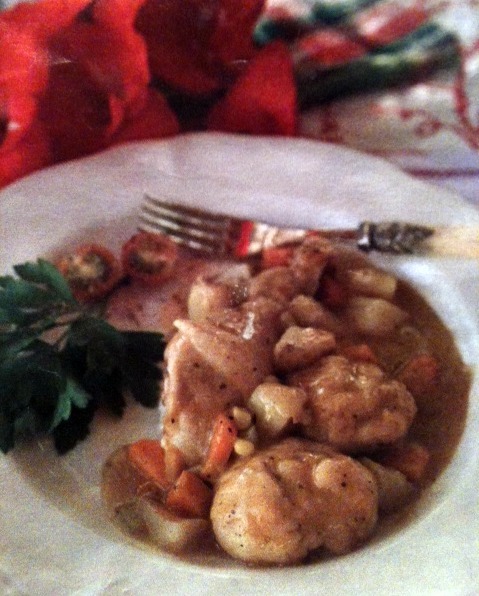 If you still have turkey leftover from Thanksgiving, you MUST try this recipe. If you don’t, go bake another turnkey because you MUST try this recipe. 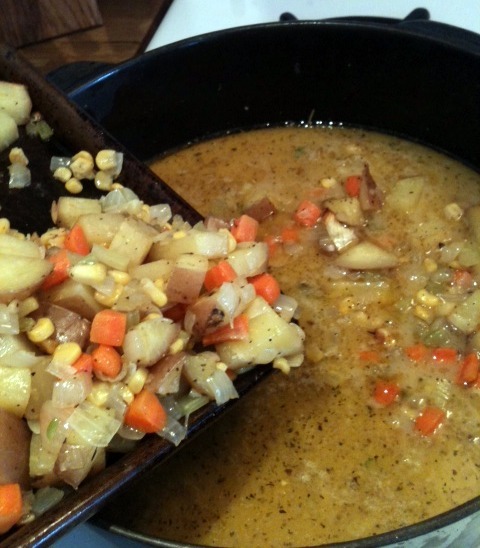 I will admit, it is not particularly sophisticated, but it is perhaps the most comforting comfort food on the planet. It’s from Mary Janes Farm magazine, but I couln’t find it anywhere online, so I took a picture of the little well-worn recipe card that I pulled out of the magazine over a year ago. I use a cast iron dutch oven that I found at a little hole-in-the-wall antique store that was going out of business a few years ago. It has a lid and everything and was perfectly seasoned already. If you don’t have a cast-iron pot, a stainless steel pot with a lid will work just fine. First, you need to make the spice mix. 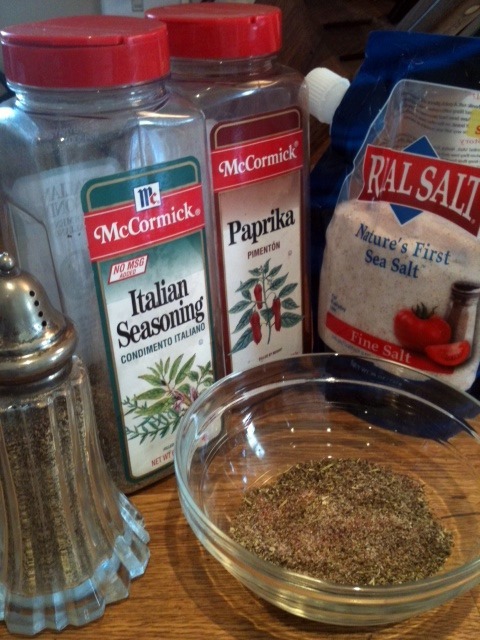 In a small bowl, mix together 1 t sea salt, 1 t Italian seasoning, 1 t pepper, and 1/2 t paprika. Then, in your pot, heat 1/4 cup oil (I use coconut oil or grapeseed oil) over medium-high heat. 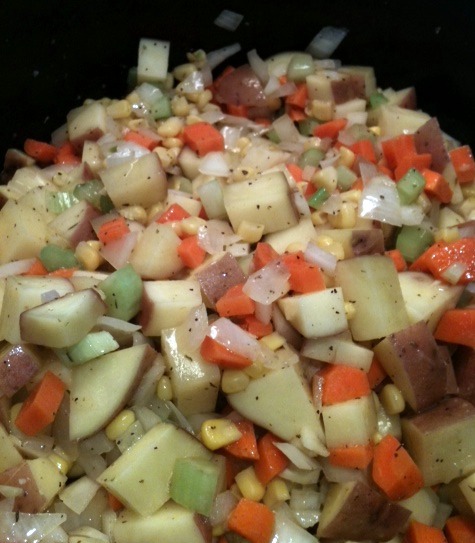 Add 5 small new potatoes, diced, 3 diced carrots, and 1/4 of the spice mix. Cook for 12-14 minutes, stirring and scraping bottom of pan every 3 minutes. Add 2 stalks of finely diced celery, 1 finely diced onion, 1 T minced garlic , 1 cup corn, 1/4 of the spice mix, and 2 T oil. Cook for 4 minutes. Remove from heat and spread vegetables out on a cookie sheet to cool. *If you forget to cook the carrots and potatoes together first (like I did), don’t fret, just put them in the oven at 400 degrees and roast, watching carefully for another 10 minutes or until the potatoes are soft. This picture was taken before I put them in the oven. Cooking is really all about improvisation, right? Let your pot cool down a bit, then add 1/2 cup butter and melt over low heat. Whisk together remaining spice mix with 1/2 cup flour; add to butter, stirring constantly for 1 minute. 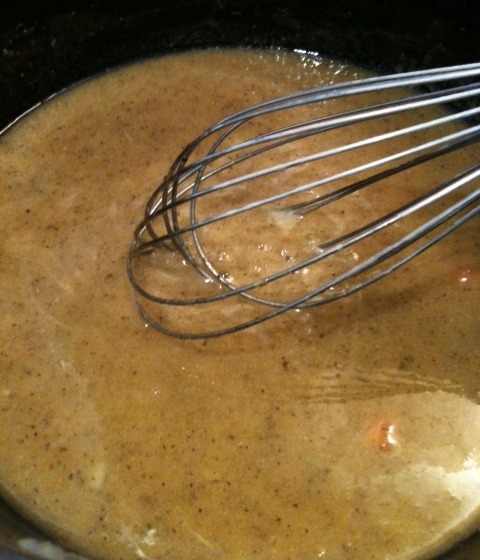 Add small amounts of broth at a time to the roux while constantly whisking. By the time you have added 4 cups of broth, you will be left with what looks like a thin gravy with a layer of better on top. Turn-up the heat to medium, cover, and cook for 5-7 minutes. Stir in 1 cup hot water, cover, and cook for 3-5 minutes. 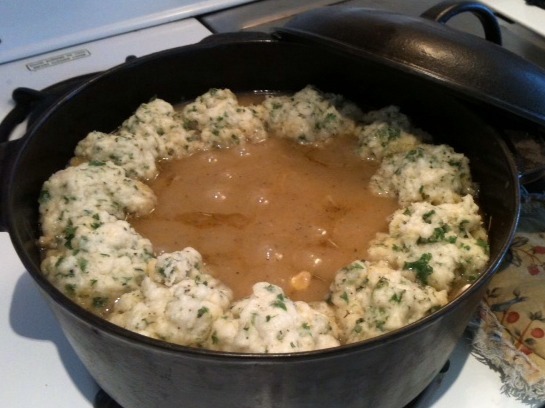 Add cooked vegetables and turkey into the pot, leaving space around the rim to add the dumplings. Reduce the heat to medium-low so the mixture just simmers but does not boil. See how soft the potatoes look know? 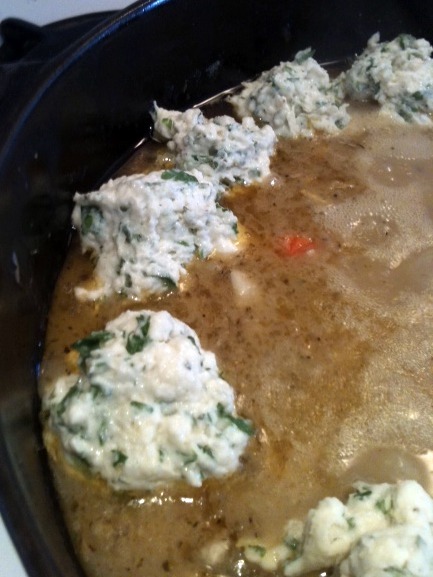 Now to make the dumplings: In a medium bowl, whisk together 1 cup flour, 1 1/2 t baking powder, 1/2 t salt, 1/2 t pepper and 2 T chopped parsley. With a fork, gradually stir in 1/2 cup milk until just combined. Drop dumpling batter into simmering liquid in 12 heaping spoonfuls, evenly spaced around the outer rim. Simmer, uncovered, for 10 minutes, then cover and simmer for 10 minutes more. 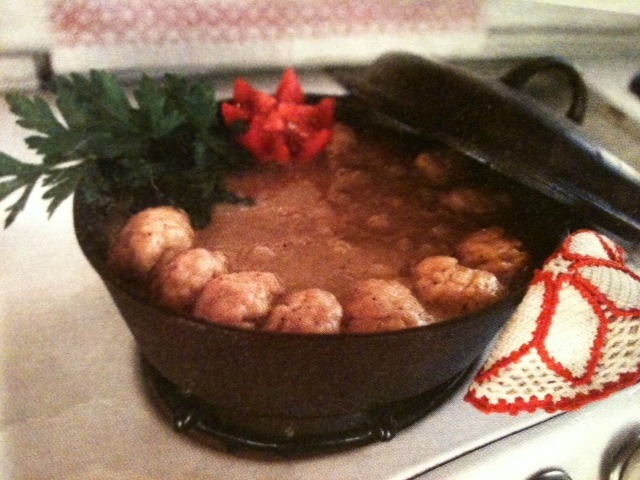 You may need to increase the heat a bit to fully cook the dumplings. Serve immediately…as if you could wait.